Since 2014, U.S. farmers have managed to produce very large corn, soybean, and wheat crops. These, and large crops around the world, have weighed on prices and created a major economic downturn for U.S. farmers. Since 2014, U.S. farmers have managed to produce very large corn, soybean, and wheat crops. These, and large crops around the world, have weighed on prices and created a major economic downturn for U.S. farmers. While record large crops have meant most farmers have enjoyed high yields, U.S. production takes place across a very wide and diverse geography. As such, some producers have seen high yields while others may have been less fortunate. This week we look at county level corn, soybean, and wheat yields to better understand how crop yields have varied across the country during the economic downturn. Areas where yields have been particularly high should have weathered the economic downturn better than areas where yields may not have been quite so good. For both corn and soybeans, the 2014, 2015, and 2016 growing seasons have produced the three highest national crop yields in history. Wheat yields in 2016 were at an all-time high as well, but 2014 and 2015 were not quite as good for wheat production in the U.S. Still, it is hard to argue that the last three years have been anything but ideal for crop production in the U.S.
To dig deeper into the yield statistics, we looked at county level yields for each of the three crops. Because there are a wide variety of wheat types produced in the U.S., we settled on looking at hard red winter wheat production. As David pointed out a couple of weeks ago, it is very important to consider trend yield adjustments when looking at crop yields over time. We calculated the trend yield for each county and each crop from 1960 to 2016. There are a variety of opinions about what period and methods should be used when calculating trend yields and we won’t go into them here. Rather, we simply use a standard linear trend over the time-period. After calculating the trend yields we wanted to see how each county has fared in the three years that comprise the major farm economic downturn, 2014, 2015, and 2016. To do this we calculated the average total bushels that each county was above or below trend over these three years. For instance, if a county had corn yields that were above trend by 10 bushels in 2014, 15 in 2015, and 5 in 2016, it would have averaged 10 bushels above trend over these three years. We then calculated the ratio of the above/below trend to 2016 trend yields. This produces a percentage above/below 2016 trend for the three years of the economic downturn. In our previous example, if that county had a trend yield of 200 bushels per acre it would have averaged 5% above the 2016 trend yield. From 2014 to 2016 across all counties the yield deviation averaged 7.8% above the 2016 trend. The average deviation from trend yield by county is shown in Figure 1 (some counties have been excluded for missing or incomplete data). 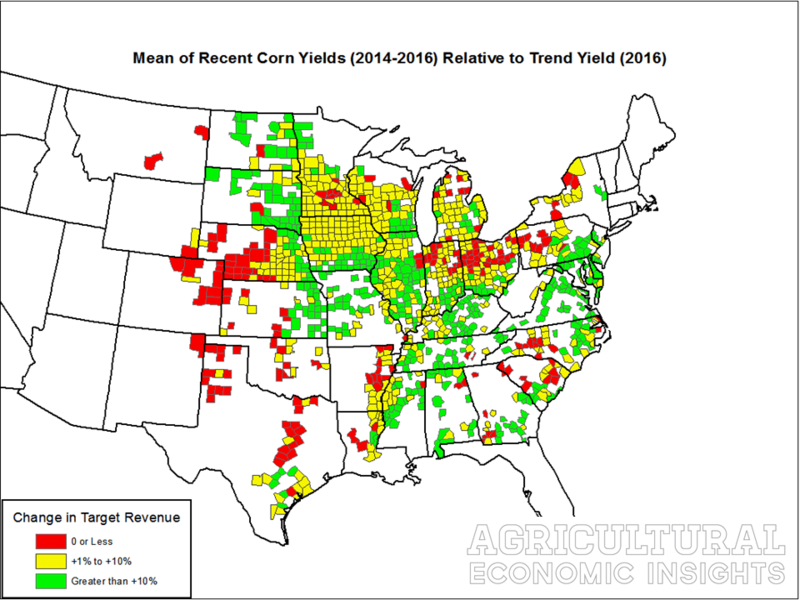 Counties that produced three years of average yields that are 10% above the 2016 trend yield are shown in green, those with yields between 0 and 10% above yellow, and those that averaged less than trend in red. Keep in mind that averaging 10% above trend yield for three years is quite an accomplishment. Figure 1. Mean of Corn Yields (2014-2016) Relative to Trend (2016). As one can see there are counties that have done very well in nearly every major production state of the country. However, most of the major production states also have counties that have struggled. For instance, note the red counties in the Eastern Corn Belt states of Indiana and Ohio. Nebraska is another state with a wide diversity of yield experiences. Here, the Western half of the state is dominated by red counties with yields averaging below the 2016 trend, while the far Eastern counties are green with yields above 10% of 2016 trend. Iowa is notable in that not a single county in the state averaged below trend over that time. Likewise, producers in Illinois, the Dakotas, and Missouri also seemed to fare quite well. Similar calculations were made for soybeans (Figure 2) and wheat (Figure 3). The most notable difference between the corn and soybean results is that many fewer counties had sub-par soybean yields. This speaks to the exceptional soybean production that we have experienced in recent years. Only 11% of the counties shown in the map averaged below the 2016 trend in this time. In the case of corn, 17% of the counties had a below trend average. The other notable feature is that many areas that didn’t do as well with corn seemed to have better soybean production. For instance, there were few below trend counties in Indiana, Ohio, and the Western half of Nebraska. Likewise, areas that did well with corn also did well with soybeans. For instance, most of Iowa and Illinois had outstanding production years. Figure 2. 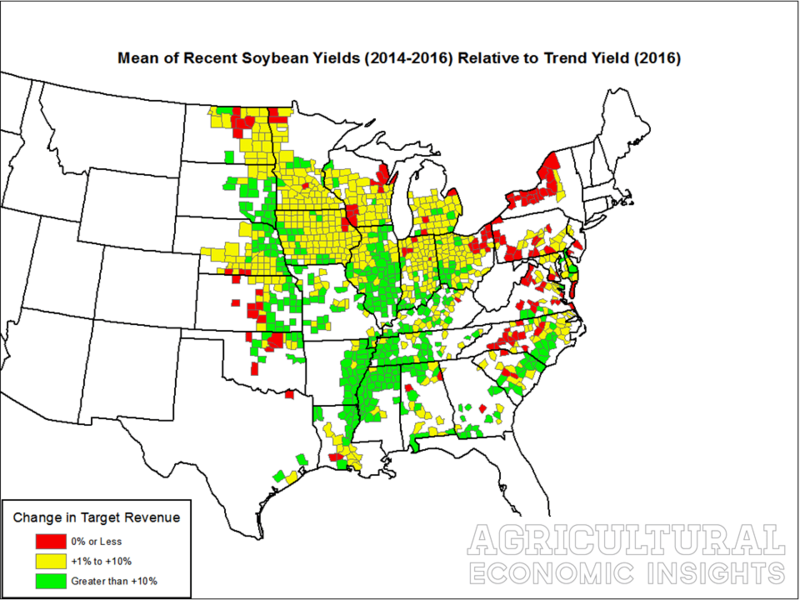 Mean of Recent Soybean Yields (2014-2016) Relative to Trend (2016). In the case of wheat (Figure 3), the picture is much less rosy. 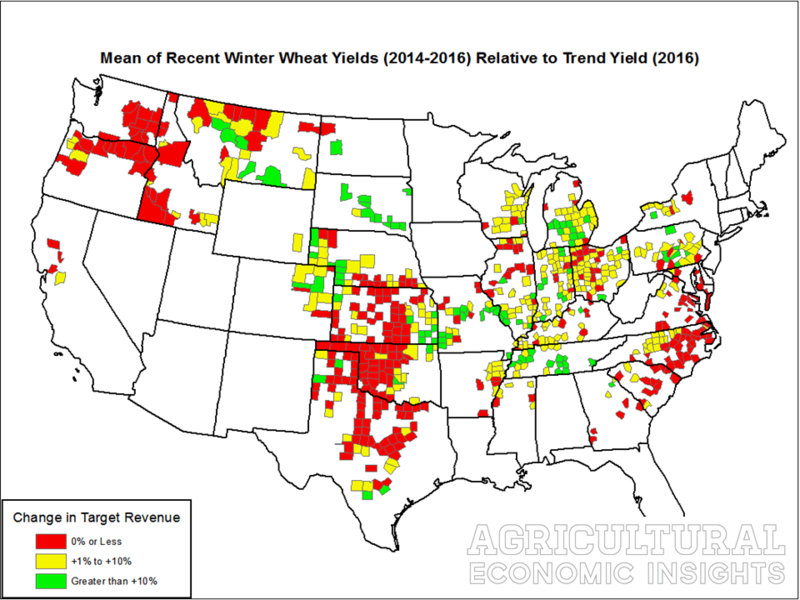 In addition to poor prices, production in much of the hard-red winter wheat producing regions has also been sub-par in recent years. For instance, one can see large swaths of red through the heart of the Great Plains. Figure 3. Mean of Recent Hard Red Winter Wheat Yields (2014-2016) Relative to Trend (2016). At the national level, the last three years have been particularly good for corn and soybean production. While most areas have had excellent production, there is diversity across the U.S. Some production regions have not fared as well as others. For those with truly exceptional production, the increased bushels have helped to cushion the blow of lower commodity prices. For producers in regions that have not experienced high yields, the lower prices hit much harder. Over the last three years, producers in 17% of the corn producing counties have experienced yields that averaged below the 2016 trend. These are areas where one might expect more financial stress. For the most part, the areas of high and low production are spread throughout the country. Most states have had a mix of outstanding and below trend yields. The exceptions might be that most counties in Iowa and Illinois had exceptional yields. States like Nebraska, Indiana, and Ohio tended to see much more diverse outcomes in the case of corn production. The results were most bleak for wheat production where the major production regions have not had outstanding production, yet prices remain very depressed. The Kansas City Federal Reserve recently released a report that examined how financial conditions appear to be diverging in their district. In particular, they noted that financial conditions seem to be stable in the Eastern part of the District, while bankers in the Western part of their district are reporting more financial stress. The yield differentials described in this week’s post are likely one contributing factor for such observations. As we move forward this year, it will be particularly important to monitor producers and farm income in areas that have not had the benefit of high yields to help them offset the much lower crop prices. Many of these areas are likely outside what people think of as the heart of the U.S. Corn Belt.